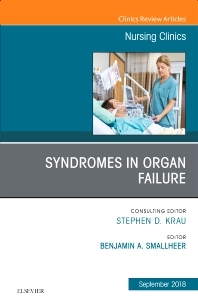 With collaboration of Dr. Stephen Krau, Consulting Editor, Dr. Benjamin Smallheer has created an issue of Nursing Clinics that provides a unique look at syndromes that cause organ failure or dysfunction. Expert authors contributed clinical reviews with up-to-date content in the following areas: Hyperglycemic Syndromes; Immunocompromised/Autoimmune Syndromes; Multiple Organ Dysfunction Syndrome; Fat Embolism Syndrome; Generalized Pain Syndromes; Malabsorptive syndromes; Munchausen/Munchausen by Proxy Syndrome ; Pickwickian Syndrome; Adrenal Syndromes; Male & Female Hypogonadism; Polycystic Ovarian Syndrome; Chest pain Syndromes (non-cardiac); Restless Leg syndrome; Degenerative/Debilitative Neurologic Syndromes; and Paroxysmal Sympathetic Hyperactivity Syndrome. Readers will come away with the clinical knowledge they need to improve patient outcomes.